It amuses me that as soon as I flip the calendar from August to September each year my cravings for soup begin. This year is no different from any other because soup has been on my brain since the first of September. Overnight the temperature cooled making today the day I absolutely had to make my first pot of steaming, hot corn chowder. The pot I chose to use was my slow cooker. 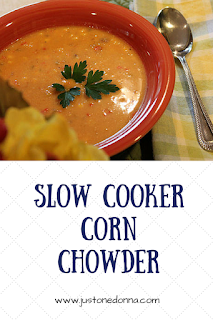 Nothing can be easier than cooking up this hearty corn chowder in your slow cooker. Bacon adds heartiness and flavor to this chowder so you'll want to start by frying up about four slices of your favorite bacon. I like to keep my bacon in the freezer, packaged in four-slice portions. That makes it easy for me to pull out just what I need. Freezing the bacon makes it easy to dice for any recipe. Fresh corn is the star of this chowder. While you could substitute frozen corn, please don't. 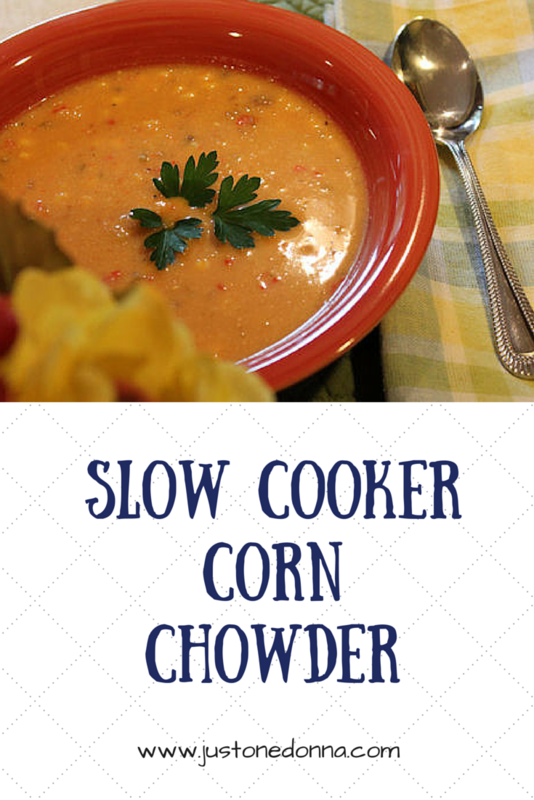 Adding the cobs to your slow cooker with the rest of the ingredients deepens the wonderful corn flavor. Tip: Add corn cobs to your pot when making corn chowder for hearty corn flavor. Cook the bacon over medium heat until brown and crispy. If you have a Ninja Cooking System you can do this right in the pan on the stovetop setting. I love that! Remove the bacon from the pan and drain on paper towels. Overturn a small bowl inside a larger bowl and cut the corn kernels off the cob using a large knife. Tip: Hold an ear of corn on a small bowl inverted in a large bowl to collect corn kernels when cutting them off the cob. Break the cobs in half and place in the bottom of your slow cooker. Add all of the ingredients except the milk to the slow cooker. Cover and cook on high for 7-9 hours, until the corn is tender and flavorful. Discard the corn cobs. Remove half of the mixture from the slow cooker to your blender. Puree the mixture and return it to the slow cooker. Stir the milk into the mixture. Taste and adjust seasoning as needed. Continue cooking on high until warmed through.